Campaign signs bespeckle this neighborhood wall on the traffic-busy corner of Pu‘unēnē and Wākea Avenues, across the street from Christ the King Church. Ah, the rainbow colors of campaign banners are up again this year! If you’re at an intersection, they’re plastered everywhere on corner fences, walls or grassy areas. Perhaps you started noticing this in March. I spotted the first campaign banner right on New Year’s Day hanging on a residential fence in Waikapū, Hawai‘i. It’s campaign season once again! The battle of radio, TV, facebook ads and print ads have begun. Not to mention bumper stickers, friend to friend cards, coffee hours, house-to-house canvassing, phone banks, and rallies. Every two years, our County experiences election year throughout the year. In 2014, then Lt. Gov. Shan Tsutsui and District 5 State Sen. Gil S.C. Keith-Agaran, who also writes for the Fil-Am Voice, made time to sign wave at potential voter traffic on Ka‘ahumanu Avenue, fronting Kahului Shopping Center in Kahului. 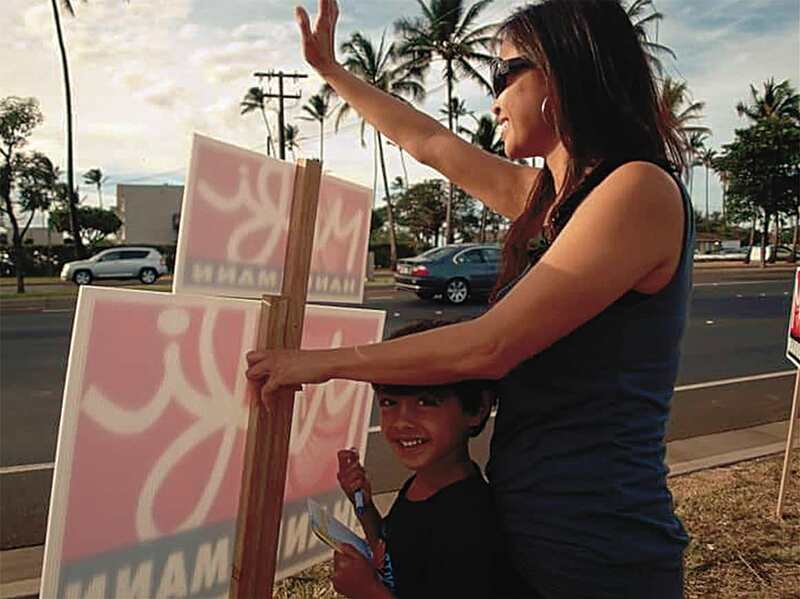 One form of campaign musts for Maui is sign waving. How do you feel about sign waving on the road sides? Personally, I’m not a fan. I just feel as if we are placing many of our loyal sign wavers at risk when we do a line up on the roadside of major highways, most of the time located during the busiest traffic time to best gain more exposure. The County Council passed a bill banning cell phone use while driving. “With motorists increasingly using unsafe practices like texting while driving, we find ourselves joining the state’s other counties in enacting this new law,” Maui’s Mayor Charmaine Tavares said at the July 6, 2010 signing. Maui was the last of the State of Hawai‘i’s counties to adopt distracted driving laws. I first participated in sign waving for a political candidate during the 2010 gubernatorial race. Now that was a fun campaign! Although our candidate didn’t win, I gained lifetime friends by connecting with likeminded leaders. We developed an even stronger bond over the years by getting involved with each other’s network and community service. Now, campaigning has its less-than-pleasing moments too. 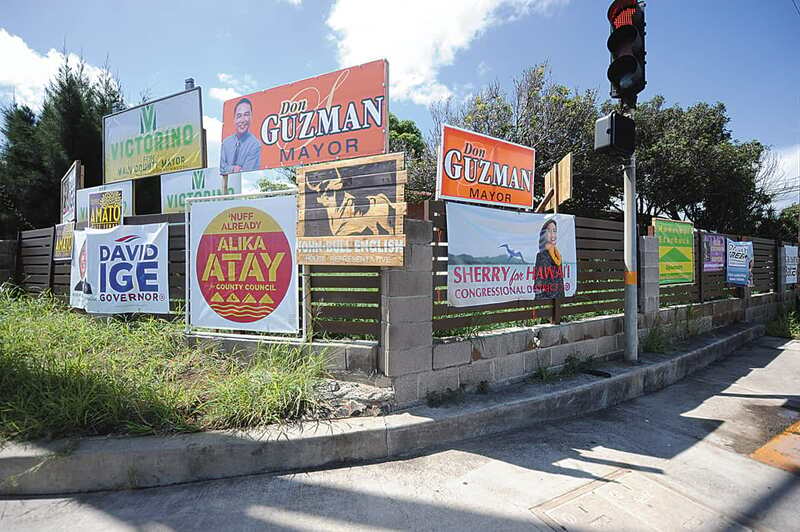 Is it possible to have a successful campaign without sign waving on the road side? For candidates, this is a low-cost way to be noticed by drivers rushing to and from work. Talk about a captive audience, especially if you happen to get stuck at the light and the candidate you may not necessarily be a fan of waves at you. Awkward moment. Another thing about sign waving that I’ve learned is that the candidate with the largest crowd of sign wavers doesn’t necessarily win the election. This was true during a recent primary election night. A candidate believed to be a winner in the primary lost by a few votes. One of the candidate’s supporters blurted out his dismay as he wished he had actually gone to the polls to vote for his candidate. He was in all the campaign sign waving and chili and rice events but did not vote. He shared that he thought it was looking like an automatic win for his candidate. Tragedy is the word that comes to mind. The one thing that mattered was his vote on the ballot and perhaps many others thought the same way, leading to his candidate’s loss. Others used work on Saturdays so voting in the primary election was out of the way and out of the question. But that’s why we now have absentee ballots! One can easily download the form and mail it in. 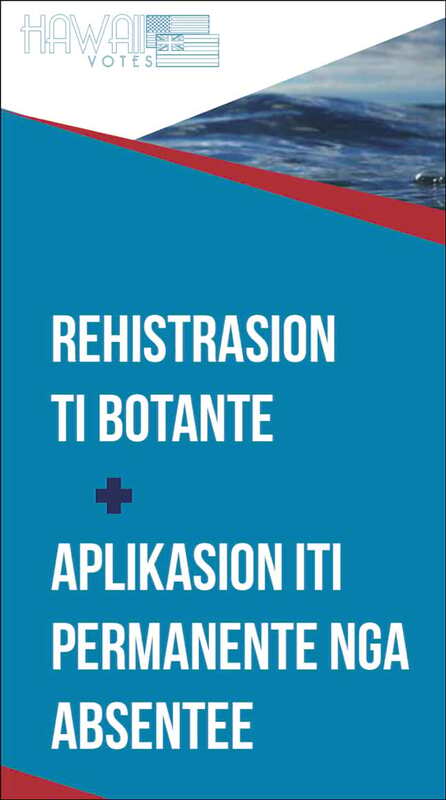 Visit http://elections.hawaii.gov/wp-content/uploads/Voter-Registration-and-Permanent-Absentee-Application_Form-Fillable.pdf. Finally, one of the more popular reasons why my Filipino friends will not participate in the U.S. voting system—it is rumored that once they register to vote, their names will be automatically included in the jury pool. That is something that they want to avoid at all costs. An even larger tragedy. Q: Are jury lists derived from voter registrations? A: Yes, jury lists are compiled from voter registrations, driver’s license and state ID renewals. In essence, because of the low voter turn-out, getting a driver’s license, state issued ID, buying a home, and filling tax returns can get you on the list as well. Point? If you choose not to vote only to avoid the jury pool, this has no impact. So please register and exercise your right to select your elected officials. Filipinos are now the second largest ethnic group in the state of Hawai‘i. According to the State of Hawai‘i Department of Business, Economic Development and Tourism’s Research and Economic Analysis Division, there are 352,100 Filipinos and part-Filipinos in Hawai‘i, constituting 25 percent of the state’s population. More than Japanese, Chinese, Korean, Hawaiians and part-Hawaiians. Sixty-eight percent of Filipinos were born in the United States. 20.6 percent of Filipinos are foreign born and naturalized citizens while 11.4 percent are foreign born and not U.S. citizens. Seventy percent of Hawai‘i’s Filipino population live on the island of O‘ahu. On Maui alone, out of the total population of 144,444 there are 40,643 Filipinos and part-Filipinos (28 percent), while Molokai’s 2,254 Filipinos and part-Filipinos comprise 30.7 percent of Molokai’s population and Lāna‘i’s 2,003 Filipinos and part-Filipinos comprise 63.9 percent. On a national level, according to the Pew Research Center, Filipinos are the second largest Asian American group in the U.S. with over 3.4 million. The majority of Filipinos and part-Filipinos in Hawai‘i identify themselves as Democrats followed by Republicans and Independents. As the largest Asian ethnic group in Hawai‘i, and with approximately 4,000 Filipinos arriving each year, Filipinos and part-Filipinos are leading in population and growth in the State of Hawai‘i. As such, we could potentially make a big impact in the political climate if we vote. Even Philippine President Rodrigo Duterte has said “Filipinos in America are not Filipinos anymore, they’re Americans. Their attitude is American.” Yet it still puzzles me to hear of Filipinos who will not register to vote in Hawai‘i’s elections but took the time to participate in the 2016 Philippine elections. Clearly their source of income and livelihood is based here in Maui, Hawai‘i, yet local politics is not as important to them as they follow the Philippine elections on The Filipino Channel or GMA networks. These non-voters miss the opportunity to elect officials who will be making decisions that will impact education, labor laws, minimum wage rates, tax increases, highways, building projects, affordable housing, homeless, tourism and many other matters that impact our daily living. Despite the low voter turn out however, there has been an increase in Filipino-Americans in elected offices in the State of Hawai‘i. 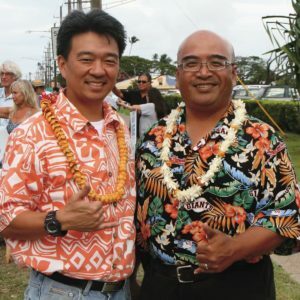 Most of the high numbers are on O‘ahu: four out of the nine Honolulu councilmembers are of Filipino ancestry and statewide, there are six State Senators of Filipino ancestry and five State Representatives of Filipino ancestry. On Maui, we have one in the State Senate (Gilbert Keith-Agaran) and two of nine (Alika Atay and Don Guzman) Councilmembers. Maui also produced the first Filipino-American elected as a Supervisor/County Councilman in the entire U.S., Richard “Pablo” Caldito Sr. (1956–1972). In 1994, Benjamin J. Cayetano became the first governor of Filipino ancestry in the entire nation (1994–2002). Back to campaigning on Maui, my son gets a crack out of a State Representative from Maui who has a certain style during the campaign season. He doesn’t have a big crowd; most of the time it’s just him and sometimes his wife accompanies him. He has the biggest smile and makes eye contact and points at each passing car. We’re talking thousands at the intersection of Haleakalā Highway and Hāna Highway. How does he do that? I should also mention this official’s hair, always in a perfect wave style. Everywhere you see him, he looks exactly the same. 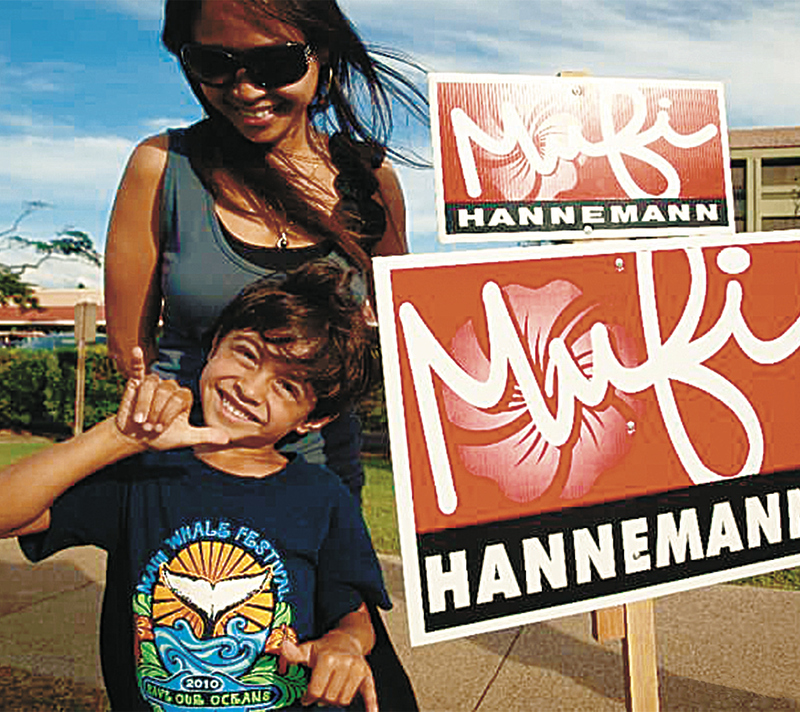 Sharon Zalsos’ son DJ (shown making the shaka sign) gets a crack out of a State Representative from Maui who has a certain style during the campaign season. True or not true? Filipinos are more likely to vote for a candidate who is eye candy or pleasing to look at versus a candidate whose picture looks closer to a mug-shot than a glamour shot. No, we’re not that shallow…or are we? Deadline to file as a candidate for elective office. Locations for Early walk-in voting for Primary election open. Early walk-in voting for Primary election ends. Locations for Early walk-in voting for General election open. Early walk-in voting for General election ends.